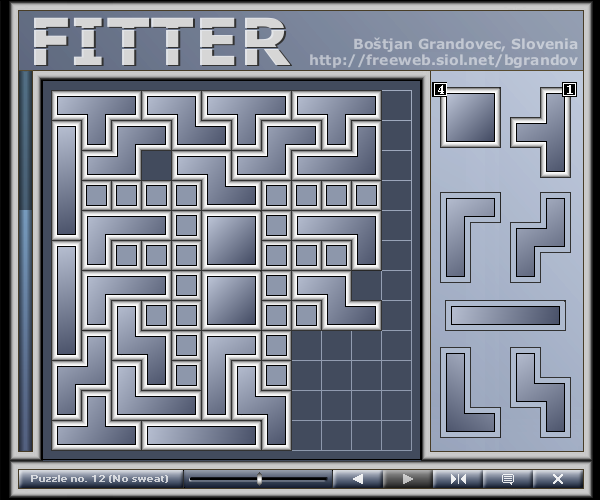 Fitter is puzzle game with the simple goal: place all shapes from the right bar onto the grid before the time is up. When task is complete, next puzzle is unlocked and available to play. When all eighteen puzzles are solved, next level of difficulty is unlocked. Pick and place a shape with left mouse button click or key 1 - 7, rotate it with mouse wheel or space bar. Shapes can be rotated, but only while picked (cursor). They can also be removed from the grid with left mouse button click and placed back on the bar. Tooltips will give you some basic instructions how to play and can be turned off at the lower toolbar, which also contains undo/redo option, restart and exit button and sound volume slider.